Family Pectiniidae, Lettuce, Plate... Corals (from the Greek "Pectinis" meaning "comb", in reference to their skeletal structure), established by Vaughn & Wells in 1943. This is a distinctive (well, more than most of the Stony Coral families) group of laminar, thin-plated species with missing corallite walls (or ones formed of the non-porous coenosteum (skeletal material) of the laminae). Four genera, all Zooxanthellate (possessing endosymbiotic algae). Due to their common habitat of shallow, semi-to turbid waters, with limited water movement, many Pectiniids are aquarium-suited species, and commonly available in the trade. Their main downside is their tendency to strongly sting any near immotile livestock.... space must be provided about their colonies to the extent of their sweeper tentacles. Genus Echinophyllia Klunzinger 1859: Highly variable in color, encrusting or laminar colonies showing rounded ridges that are free of the substrate; folds with corallites occasionally rising, pointed in different directions. An aggressive group of corals with strong stinging sweeper tentacles (note absence of other life around natural colonies below), at night when their tentacles are extended. Echinophyllia aspera (Ellis and Solander 1788). Common in all of its found regions, Indo-Pacific; Red Sea, east Africa to Tahiti. Below: Close ups of open and closed (night/day) polyps, and a day time retracted/skeleton image in the Red Sea. Echinophyllia costata Fenner & Veron 2000. 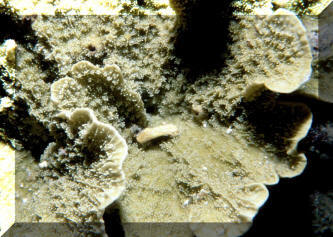 Colonies of thin laminae/blades, with distinct, evenly-spaced corallites. Septo-costae cross corallites in parallel bands. Bunaken, Sulawesi, Indonesia photo. Echinophyllia echinata (Saville-Kent 1871). Flat, initially vase-shaped colonies. Come in mottled greens, browns, reds. Fiji images. Genus Mycedium Oken 1815: Laminar colonies with corallites facing the outer margins as leafy extensions. Up to 2m in diameter. 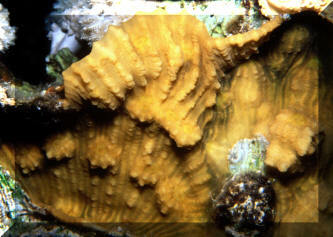 Separate corallites that protrude at angles. Septa exsert extending beyond the surface toward the outer edges. Mycedium elephantotus (Pallas 1776) Elephant Nose or Peacock Coral. 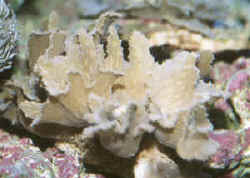 Polyps similar to Oxypora, but face away (like periscopes) toward colony margins. 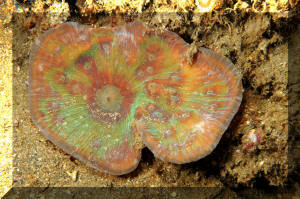 Not commonly offered, though a hardy, interesting coral, sometimes of great colors. Appreciate bright lighting, mounting vertically or otherwise placed in areas of low siltation. Right: Close up in N. Sulawesi. Below: Red Sea, Fiji, N. Sulawesi images. Mycedium steenei Veron 2000. Delicate colonies of less than a foot across, composed of uni-facial fronds in succeeding whorls. N. Sulawesi pic. Genus Oxypora Saville-Kent 1871, Scroll, Chalice Coral: Made up of thin laminar leaf-like colonies. Tentacles open only at night. Oxypora lacera (Verrill 1864) Scroll or Chalice Coral. Composed of thin lamina, scroll-like, that may be greatly thickened in areas of substantial water movement. Costae toothed (differentiating characteristic). Right: Close up pic by DiF in the Red Sea. Below one Red Sea and Bunaken/Sulawesi/Indonesia images. Oxypora glabra Nemenzo 1857. Colonies as thin convoluted plates. Bunaken/Sulawesi/Indonesia image. Genus Pectinia Oken 1815: Laminar to branching colonies of high, thin walls. Pectinia alcicornis (Saville-Kent 1871). Colonies are formed of irregular upright elements which on microscopic inspection have ridges that are minutely toothed. Usually mottled brown or green in color. Queensland, Australia at right. Below: Aquarium, N. Sulawesi and Fiji images. Pectinia ayleni (Wells 1935). Encrusting or tiered laminae that have vertical walls. Here in Bunaken/Sulawesi/Indonesia. Pectinia elongata Rehberg 1892. Characteristically spiral-arranged colonies. Brown to green in overall color. 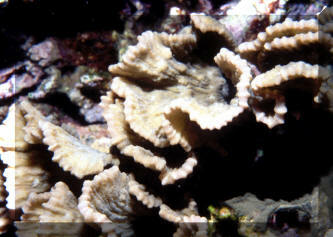 Found in muddy, slow moving waters in sandy substrates and reef slopes. Pectinia lactuca (Pallas 1766) Lettuce, Plate Coral. Indo-Pacific; Madagascar to Fiji. Colonies form submassive plates that may be up t a meter across, with valleys that generally can be traced to the center. All brown, grey or green in color. Aquarium (common swollen appearance) and Bunaken/Sulawesi/Indonesia images. Pectinia paeonia Palm Lettuce Coral. Indo-Pacific; Sri Lanka, Maldives to Fiji. 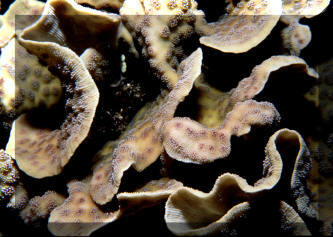 Hand sized colonies are common on turbid water fringing reefs and reef flats with cleaner waters. Photosynthetic and feeder on small zooplankton. A hardy aquarium species that does best with strong lighting and water movement. Easily propagated by "fragging". Indo. photo. A note regarding the movement, especially the collection and shipping phases of this family's members. They are fragile skeletoned and copious producers of mucus and other wastes and should be not be fed for a good week ahead of long distance travel, and packed "heavy". That is, with plenty of water per specimen, as many of these corals are lost in transit from their own pollution, and with loose 4 mil bagging material packed with them to prevent rubbing and breakage of their delicate skeletons en route. Must be carefully placed so that their strongly-stinging sweeper tentacles don't reach other immotile invertebrates. Count on at least six inches in any direction as a "no man's land" between them and other Stony and Soft Corals. Further, they should be placed on sloping hard (rock) surfaces that affords gentle current around them and given enough circulation to remove any accumulating detritus. Need not be intense, and these corals are often best placed off to the side of bright light sources, particularly metal halides. Various species have been reported to spawn in captivity and are known to be hermaphroditic. Most all specimens are wild collected with some asexually fragmented and resold/traded by local hobbyists. Due to slow growth, and current low-demand, Pectiniids are not yet commercially produced in ready numbers. All the Pectiniids are photosynthetic and do best in exposed, brightly-lit conditions. Additionally they all do feed at night with long, near-transparent tentacles. Some aquarists do, some don't... feed theirs that is. 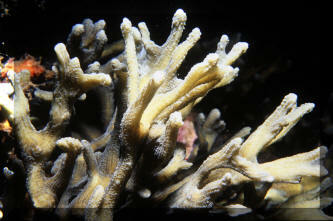 These corals are at their best being offered some fine-particulate meaty foods on an occasional basis. Principally arises from mis-collection, shipping damage, and consequent handling. Take care to handle these animals by their bottoms to prevent laceration of their thin living tissue. Exposed areas are best kept free of algae by utilizing small, more-gentle species of mainly-herbivorous Hermit Crabs. Ones obviously infested (with discolored jelly masses, receding tissues) may be aided by use of dips (lowered spg, hexose sugars, iodine or dilute malachite), and placement in sterile water under low illumination. Other than some members penchant for stinging other nearby Stony and Soft Corals, and perhaps their slow growth, the Pectiniids are a group of interesting, easy to care for coral species that deserve far more representation in the ornamental aquatics fields. Perhaps with the release of several new "Coral Books" and their popularization, consequent easy, though slow asexual fragmentation in the hobby, the Lettuce Corals will come into their own. Borneman, Eric H. 2001. 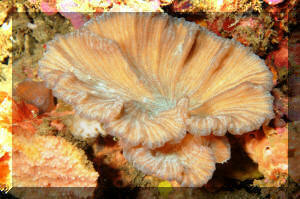 Aquarium Corals, Selection, Husbandry and Natural History. Microcosm/TFH Charlotte, VT. 464pp. Fossa, Svein A. & Alf Jacob Nilsen. 1998 (1st ed.). The Modern Coral Reef Aquarium, v.2 (Cnidarians). Bergit Schmettkamp Verlag, Borhheim, Germany. 479pp. Vargas, Tony. 1998. 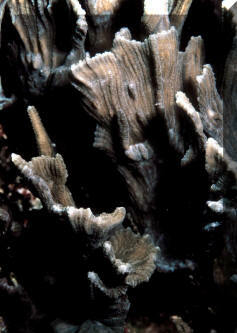 Feature Coral (column/series): Pectinia. FAMA 1/98. Veron, J.E.N. 2000. Corals of the World. Australian Institute of Marine Science. Queensland, Australia. three volumes.